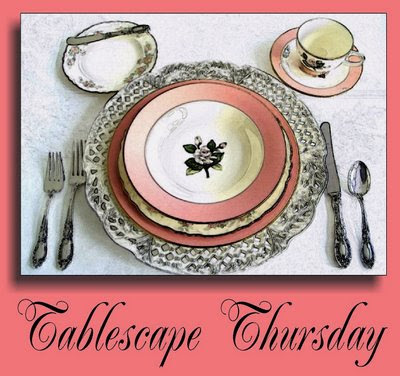 I love Tablescape Thursday. It is always so much fun to see everyone's tables and it is so nice of Susan at Between Naps on a Porch to host the event. I had company for lunch today. Company from far away from the prairie -- Montreal in Canada. 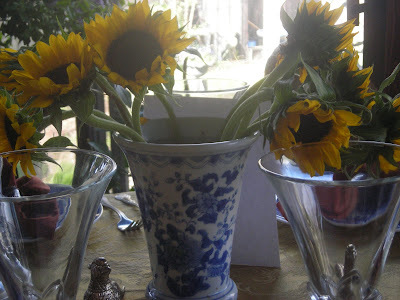 What better way to show prairie friendliness that our own sunflowers on the table. And of course, with only four for lunch, the breakfast room overlooking the garden is the perfect place for lunch. A bargain at Wal Mart a $5 a bunch, it took two bunches to make a nice showing in this blue and white vase. 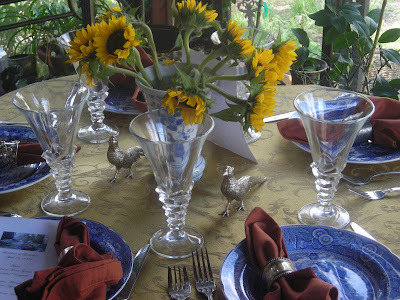 The gold tablecloth echoed the gold of the sunflowers and the brown napkins echoed the sunflower centers. Blue and white dishes went well with the blue and white vase. 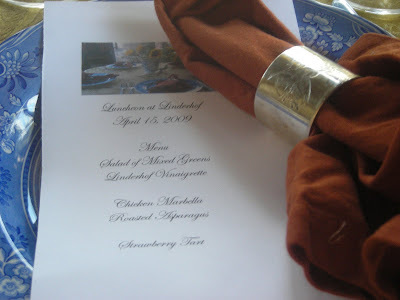 The napkins were in our antique silver napkin rings as usual. It is always fun to use a collection. The menu featured all the flavors of spring -- a salad of mixed baby greens, Chicken Marabel from the Silver Palate Cookbook served with roasted asparagus. And for dessert, a strawberry tart! They lingered long, as company usually does at Linderhof. The sunflowers look really pretty in the blue and white vase. Very nice. Blue and yellow is such a perfect theme! Love your glasses! Putting a picture of the table on the menu is a fantastic idea!!! I love it! I absolutely love your vase. It is gorgeous! Your friends were so lucky and must have felt so special! The menu is such a nice touch and I love those sunflowers! Those sunflowers are very nice indeed! Great pairing with blue and the menu is such a nice touch! Very nice. Sunflowers in the sunflower state! I love sunflowers. Oh how I wish I could be a guest at one of your luncheons. Just beautiful Martha. What a well thought out table. The flowers are gorgeous as are all of the details. I'm sure your friends were thrilled to get to sit at such a lovely table! Love the flowers against all your blue! What a nice table! 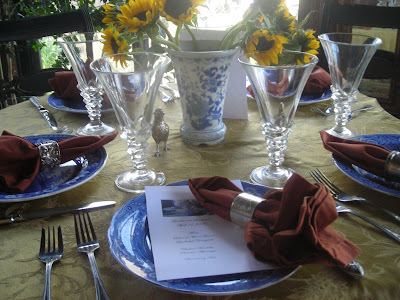 I love your tablescape.....your plates are gorgeous....and the menu with the photo is a wonderful idea. I love the sunflowers with the blue dishes. Beautiful photos.